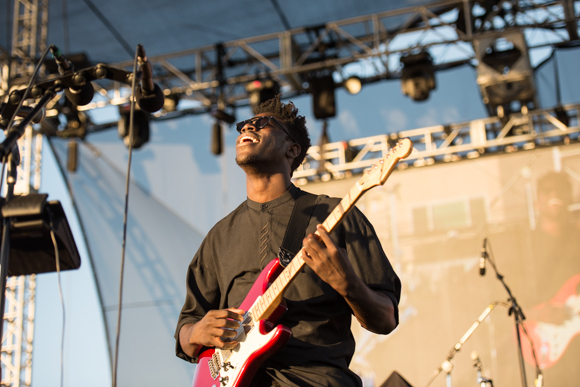 Art pop singer-songwriter Moses Sumney has just announced in an interview with the Wall Street Journal that he has in fact been quite busy since the release of his incredible debut LP Aromanticism last September. Whilst touring heavily throughout the last ten months, he hasn’t been neglecting his duties as a songwriter. According to Sumney, fans will be able to expect a new, as-of-yet untitled EP to come out this coming August 10th via Jagjaguwar, according to Sumney. Though not much could be gleaned from Sumney’s announcement, there seem to be some interesting details. Writer Mark Yarm has described the EP as “a far noisier endeavor” than the lush, ambient pop/neo soul of Aromanticism. “‘Do we have power?’ is the key question,” said Sumney, describing the EP’s subject matter. “Or ‘Who has power?’ Or ‘What is the nature of power? '” And of course, the EP includes a song titled “Power.” Apparently, the track incorporates a recording that Sumney took of a chant during a Los Angeles protest against a jury’s failure to indict ex-police officer Darren Wilson, who allegedly killed 18-year-old Michael Brown in Ferguson, Missouri.